After all of the fire and fury around the Economic Freedom Fighters and the VBS Bank scandal, which should in all honesty be called the VBS/ANC/EFF scandal, it appears the focus of our daily politics might be moving back to the situation within the ANC, the party's secretary-general Ace Magashule in particular. There now appears to be chapter and verse evidence, and more interestingly a talking witness evidence, about his relationship with the Gupta family. If what has been published so far is true, it could indicate that Magashule was involved in an easily provable wrongdoing. 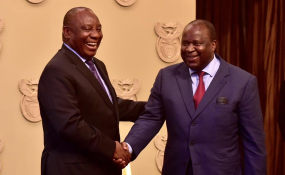 It may have huge implications for his political future, while also, once more, strengthening President Cyril Ramaphosa. Update: Just as this article was going into publication, Daily Maverick SCORPIO has unveiled another breaking investigation, this time involving Ace Magashule's involvement in the theft of a Pierneef painting that used to adorn the walls of his office while "serving" as Free State Premier. Read more of this breaking news here.